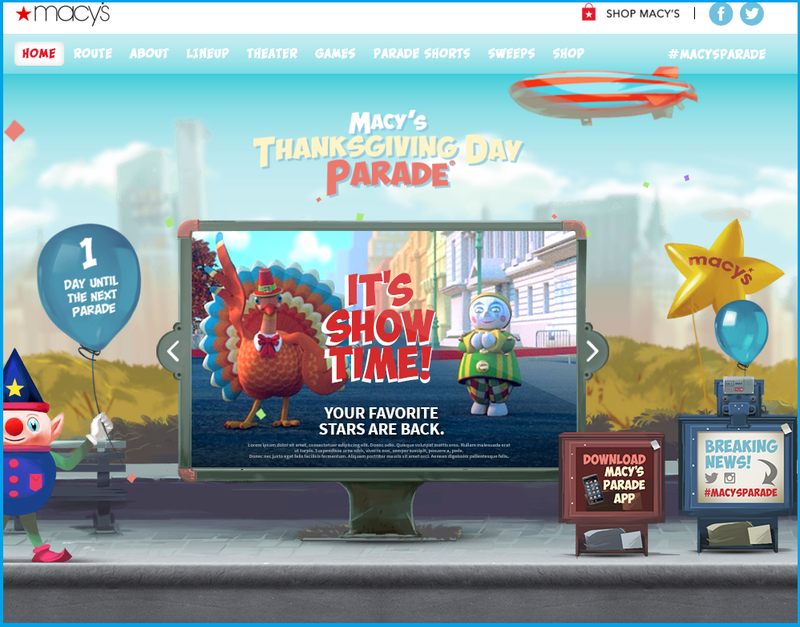 Macy’s Thanksgiving Day Parade engagement on Digital with a Sweepstakes and a chance to be at Thanksgiving Day parade features Parade Day shorts and games. 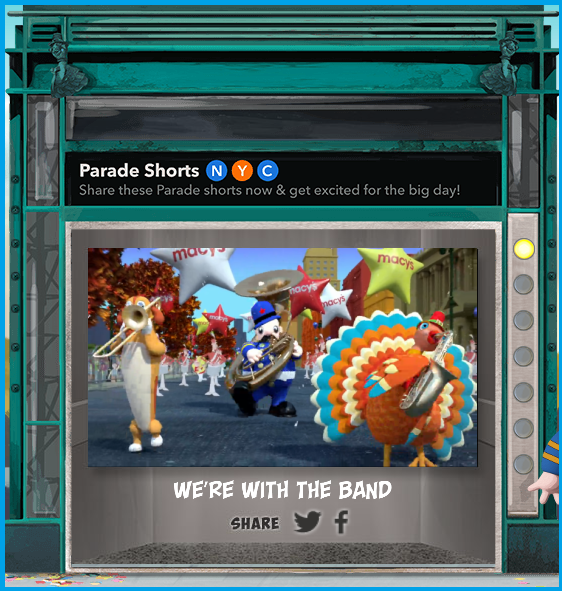 The microsite enlivens the parade digitally, where users can download an exclusive Thanksgiving Day Parade App and view the conversation surrounding the event. The 2015 Macy’s Thanksgiving Day Parade features 17 giant character balloons; 24 novelty, balloonicles, balloonheads, and trycaloons; 27 floats; 12 marching bands, 1,100 cheerleaders/dancers; and over 1,000 clowns. • Four new giant balloons will debut in the 89th Parade. New balloons include Angry Birds’ Red, DINO™ by Sinclair Oil, Ice Age’s Scrat and his Acorn by Twentieth Century Fox, and Ronald McDonald® . • Six new floats will debut including Big City Cheer! by Spirit of America Productions, The Colonel’s Road Trip to NYC by Kentucky Fried Chicken, The Cranberry Cooperative by Ocean Spray® , Discover Adventure! by Build-A-Bear, Heartwarming Holiday Countdown by Hallmark Channel, and celebrating the 50th anniversary of A Charlie Brown Christmas, Snoopy’s Doghouse by Peanuts Worldwide. Macy’s Thanksgiving parade countdown on Twitter features a sneak preview of rehearsals for the Rotten Broadway with a troupe consisting of 600 dancers. The rehearsals are live streamed on Periscope. 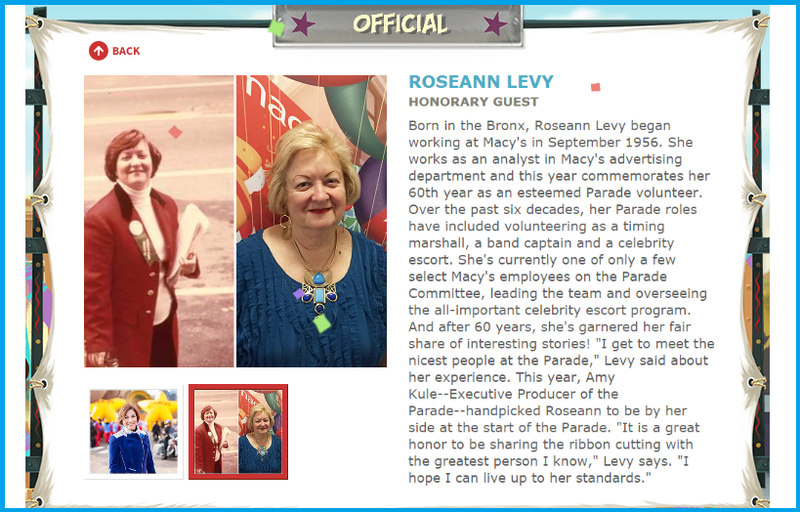 Some of the most important part of the parade are commemorating employees who have been part of the experience and the Sweepstakes. 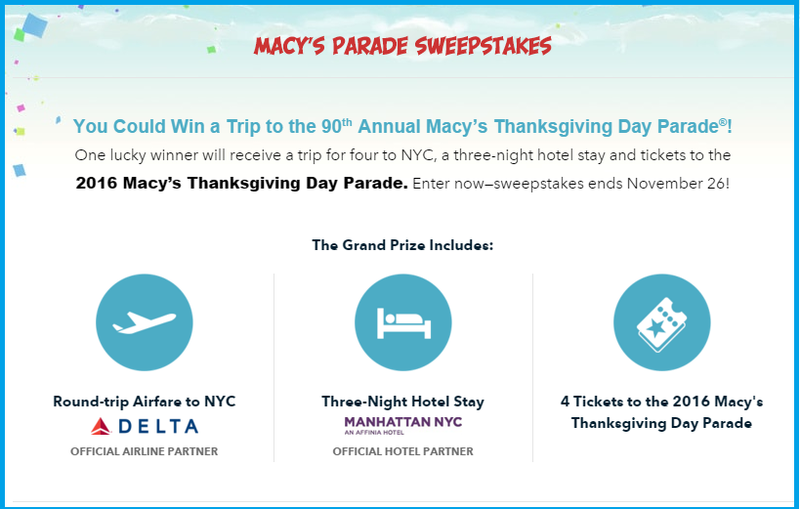 The sweepstakes launched earlier offered a round trip to NYC and a three night hotel stay and 4 tickets for the parade. Adding to the celebrations the line up is featured and so are the people who have made it possible over the years. 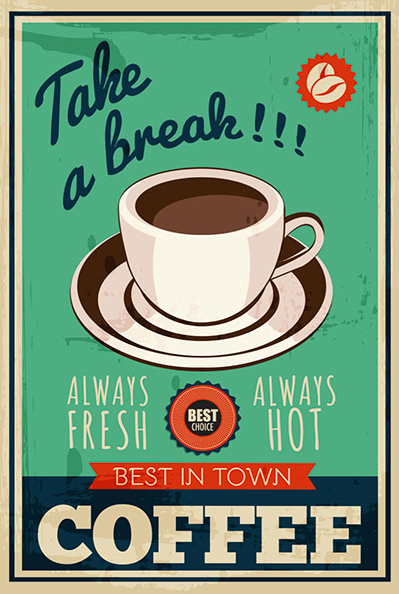 Posted in Digital, Social Media. 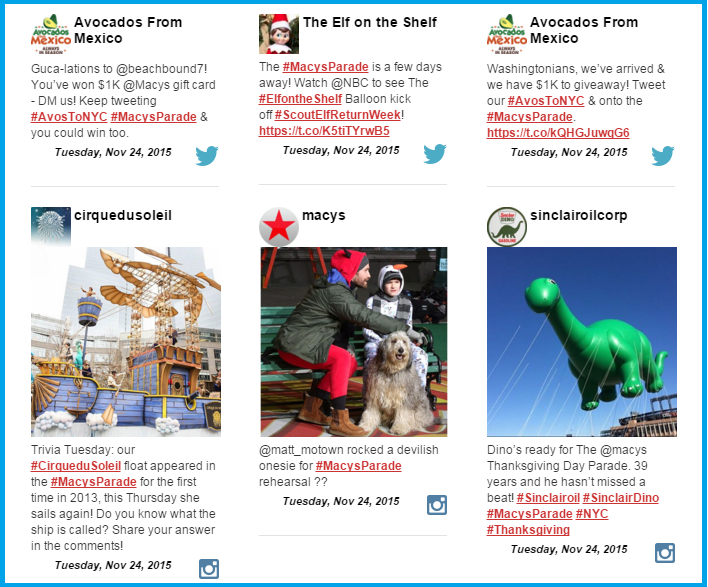 Tagged Apps, Campaign, Digital, Macy's Thanksgiving Day Parade, Retail, Social Media.